When I stood on the borders of Yafa, the line of what is real and imagined suddenly became blurred. Once Palestine’s largest city, Yafa turned out not to be figment of my grandfather’s imagination, but a tangible space, of sand, air and sea. The Palestinian-Arab identity of Yafa was evident everywhere. I was eight years old, a third grader on my first school trip. Gazans were still allowed to cross into Israel in those days, mostly as exploited cheap labour. My family was driven out of Palestine during the Nakba, the “Great Catastrophe” that saw the expulsion of hundreds of thousands of Palestinians from their homes. My family were simple peasants from the village of Beit Daras. The residents of my village were known for their love of couscous. They are also known for their legendary stubbornness, for their courage and pride. Beit Daras residents saw in Yafa a centre of many aspects of their lives. A commercially vibrant port city, known around the world for its oranges, Yafa was home to some of the largest markets in southern Palestine. Yafa was a centre for Arab culture, and a model of co-existence between religions. But British colonization of Palestine starting in 1917 then morphed into a mandate government in 1922, interrupting the natural historic flow that positioned Yafa as the beating heart of Palestine. A strata of educated elites in Yafa had raised the level of political consciousness of the city, to standards that would still be considered high by Middle Eastern criteria today. Politicians, artists, bankers, craftsmen and young and vibrant student communities gave Yafa a middle class that served an essential role in the fight against British colonialism and its Zionist allies many years before the Nakba and the creation of Israel. Yafawi union members organized around labour rights with steadfast commitment. Arab labourers were being laid off and Jewish labourers, coming from Europe were taking their place. That mobilization become part of the 1936 strike and revolution, Palestine’s first collective uprising, which inspired generations of Palestinians until this day. Numerous villages and small towns looked to Yafa for guidance, and sometimes survival. My grandfather, who owned a small piece of land in Beit Daras, was a craftsman who weaved baskets. Every few days, he hauled the best of what he made into the Isdud and sometimes al-Majdal markets hoping for few extra Palestinians dinars to supplement his meagre income. But the best was saved for Yafa, because the Yafawis had the best taste. He would put on his poshest outfit for this trip. After feeding his trusty donkey he would pile his baskets on the cart and embark on the long journey. ‘Sido (grandpa) please tell us stories about your adventures in Yafa,’ we would plead him, as he sat atop an old mattress in his special corner of a small, decaying house in a refugee camp in Gaza. His stories, which he conveyed with much suspense, trode a fine line between truth and fantasy. When I grew up, I realized that the fantasy was not simply his way to amuse us children, but also a way to express how Yafa represented my grandfather’s greatest triumphs and most humiliating defeats. Fantasy helped him make sense of the world he had left behind. When the Arabs revolted in 1936, Britain hit back pitilessly. Not only did they kill, imprison and exile many Yafawis, they also defaced the city. Large parts of the Old City were being erased never to be seen again. History was violently undone. Grandpa only spoke rarely of the general strike declared by Palestinian political parties, and of the three-year rebellion that followed, which saw thousands of young men shot, executed, imprisoned and deported. He was one of the thousands who defended Palestine to the bitter end. Although he was a peasant, who had taught himself how to weave baskets to survive, later he exchanged everything for an old Turkish rifle to defend Beit Daras, as nearby villages were falling in the hands of Zionist militias, one after the other. Grandpa said much about how beautiful Yafa was. How when the gentle breeze of the sea greets you as you enter the city, that you feel as if that your soul has returned to you.He told us how, on an usually dark night, he was chased by hyenas on his way back from the city. “It was a box of matches that saved my life”, he said. “Hyenas are scared of fire”, he would say with so much foreboding, and my grandma would shake her head to confirm the authenticity of the story. But grandpa would always go back, despite the threat of wild animals, Zionist militia ambushes, British police, and more. He had to go back because only then his soul would return to him. When Beit Daras fell after successive battles between Zionist militias and villagers armed with only a few rifles, grandpa’s soul was trapped forever. When Plan Dalet, the masterplan through which most of Palestine was violently conquered, was implemented following the calculated departure of the British forces, the capture of Yafa became the culmination of a violent campaign. Dalet’s final phases were made of six major operations. Two of these: Operation Nachshon and Harel, aimed at destroying Palestinian villages between, in and around the Yafa-Jerusalem border. By cutting off the two main central areas that composed the proposed Palestinian state, according to the UN partition plan, the Zionists wanted to break any possibility of any Palestinian geopolitical cohesion. They succeeded. The highway between Yafa and Jerusalem was a theatre for heroic battles, culminating in the battle of Castal, a few miles away from Jerusalem. The legendary Palestinian commander Abd al-Qadir al-Husseini fought his last battle, leading a successful counterattack. The Irgun and Stern Zionist gangs complemented the work of the Haganah, leaving their most memorable mark in the small village of Deir Yassin, three miles away from Castal. They killed nearly 250 Palestinians there, a gruesome massacre that heralded more bloodshed to follow. 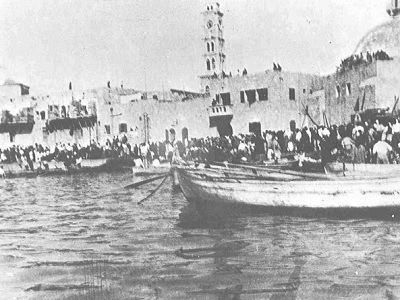 Yafa, known as the “Bride of Sea” was conquered between April and May, 1948. A major exodus was already underway into Transjordan and Syria. Zionists forces belonging to the Haganah and Irgun set aside their supposed differences as they moved in against Yafa. Three different military campaigns were launched simultaneously – Chametz, Jevussi and Yiftach – through which Yafa, areas around Jerusalem and the whole of eastern Galilee were seized. But when Yafa fell, the pride of Palestine was crushed. The city was encircled, forcing thousands of people to flee by sea to Gaza or Egypt. Many drowned as small, overcrowded fishing boats gave in and sunk. The Arab leadership had hoped the British would not allow the Zionists to conquered Yafa. They were ill-prepared. Civil defence arrangements were almost non-existent. The military disparity between Jewish militias (numbering at about 5,000 well trained fighters) and Arab volunteers (numbering around 1,500) was impossible to overcome without backing from the outside. None came. Men and women died in droves. Ten of thousands were on trek over land, but mostly by sea. Since then, every attempt has been made by Yafa’s new residents to erase that past – with all of its moral burdens – but they cannot. Yafawis who stayed in Yafa continue to fight for their identity and the identity of their city. Yafawis outside remain committed to the legacy of their ancestors. At eight I discovered that Yafa was not a fantasy. Much later in life, I discovered that Yafa, although conquered in battle, still stands through the collective memory of Yafawis everywhere. 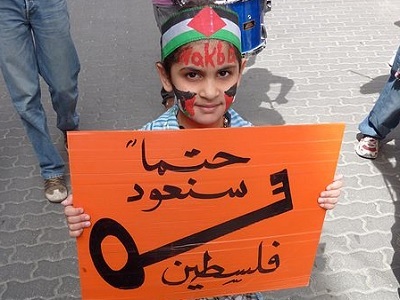 While the term Nakba (great catastrophe) – might be a fitting depiction of what has befallen the Palestinian nation in 1947-48, it is somud – steadfastness – that keeps the millions of refugees holding on tight to their right of return 66 years after the land of orange trees was conquered, and its somud that will keep Yafa alive, forever.